The dress code for golf has evolved in keeping with the game itself. As times have changed, the outfit for day-to-day play has kept pace. Today fashion clothing is all the rage. Photographs of golfers in the early 1900s show them wearing the uniform of the day. They typically wore baggy plus-four trousers and a thick Norfolk jacket. 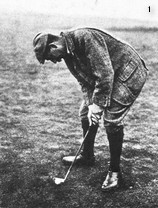 Harry Vardon expressed the view that his jacket helped to hold his swing together. The Norfolk jacket was made of sturdy tweed, a rough unfinished woollen fabric that was moisture resistant. It was fashionable not only for golf, but for other outdoor pursuits such as hiking, fishing and pheasant shooting. Underneath were the customary collar and tie and occasional waistcoat. Knee-length woollen socks, stout shoes and a Tam o’shanter or flat cap completed the look. Ladies were attired in full Victorian wear as it was not considered important for them to win at competitive sports. When Vardon toured America in 1900 to give a number of exhibition matches, the local establishment keenly made note of his signature outfit. Knickerbockers were not unknown, but it was children who mostly wore them. Such was the influence of the man the golfing public took to wearing the same outfits as their overseas cousins. American golfers were undoubtedly the front runners in the changing dress code, being well ahead of the more conservative British. From heavy drab clothing that was cumbersome and inhibited the swing to today’s multi-coloured garments with moisture wicking fibres. The 1930s saw a gradual phasing out of the jacket especially when the weather was warm. The tie, knitted cardigan or Argyle sweater was the new more casual uniform and trousers started to replace the traditional plus-four and plus-two. With time more stylish and practical clothing started to appear and by the 1940s the tie was largely abandoned and the short-sleeved knitted shirt was in vogue. Shoes were an earlier exception and had become a fashion statement in their own right. Bobby Jones championed two-tone brown and white golf shoes in the 1920s. The Prince of Wales helped spread their popularity when during a diplomatic visit in 1924 he wore tan and white spectator sport shoes. To say that the early dress code for golf attire was monochrome and uninteresting was to understate its blandness. The only colour in the game came from individuals like Walter Hagan who were happy to buck the trend. A fashion statement of Sam Stead was to change fairly often the colourful broad band on his snap-brim Palmetto hat. In the 1960s Gary Player discarded red and white clothing and chose black instead. He claimed that it gave him strength as it held the warmth in. When he played St Andrews in the 1960 British Open he wore unusual trousers in the first round with one leg black and the other white. In the United States Jimmy Demaret pioneered wearing colours other than black, white, and gray. Doug Sanders, who was known as the peacock of the fairways, spent a lot of money and time on his wardrobe of brightly coloured shirts and slacks. Jumbo Ozaki who has a passion for purple was the pioneer of colourful clothing in Japan. Fashion clothing is now big business and clothing manufacturers are in the ascendancy in their influence on the golfing scene. A number of well known golfers have their own clothing lines and the sticker price for their logo items is set in the same way as fashion houses price their perfumes. Most private clubs retain a dress code, with collared shirts obligatory with no obvious advertising on them. Members and their guests are asked to dress in good taste to maintain the dignity of the game of golf. At public courses they try to ban jeans, t-shirts and flip-flops, but are mostly unsuccessful as they are no marshals to enforce the rules. The fashion trend is now firmly set by celebrities, and young charismatic golfers on the various tours. The dress code of the future has become the province of the youth. Where it will all end remains to be seen. Maybe professional golfers will become walking billboards like Formula One racing drivers. Of one thing about dress code there is no doubt. As in the case of King Canute, no-one will be able to hold back the rising tide of fashion. It was Mark Twain who astutely remarked "Clothes make the man; Naked people have little or no influence on society."